Throw Up 20.18 Project. The Throw Up 20.18 project organised by Highland Print Studio, Inverness to capture and portray original artwork as a legacy to the shinty clubs involved. Pictured (L-R) Artists; John McNaught (Skye shinty club artist), Deidre Nelson (Newtonmore shinty club artist) and Steven MacKenzie, Beauly Club Secretary and Vice-President of the Camanachd Association. 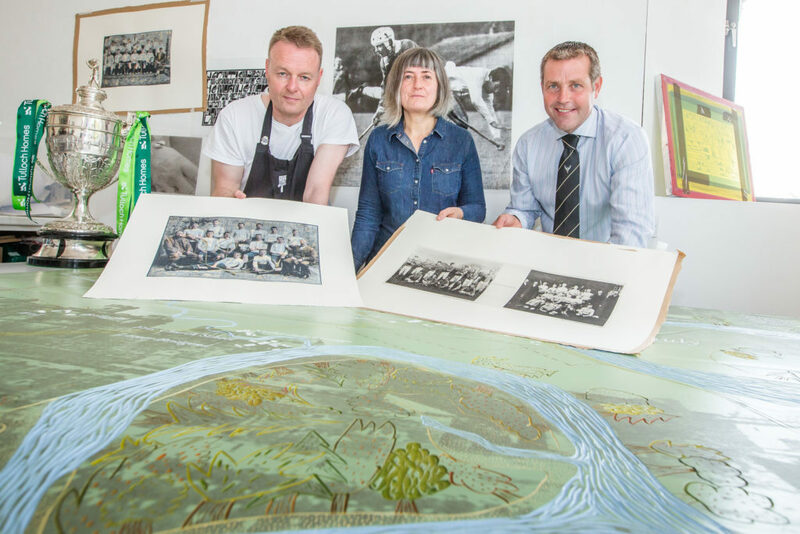 The worlds of art, specifically printmaking, and shinty have come together for a project that celebrates the culture and heritage of one of Scotland’s oldest sports. The Throw Up 20.18 project commissioned four artists to work with designated shinty clubs during 2017 and into the 2018 season. 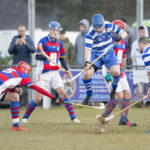 A selection of the final work will be exhibited for the first time at this weekend’s Camanachd Cup final in Oban (Saturday September 15). 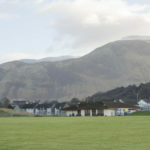 Fort William Shinty Club by John MacNaught. Photo gravure print. The artists involved have created a series of artworks inspired by the contemporary culture and heritage of the iconic, indigenous sport. Over the past 12 months they have spent time getting to know the people involved in the clubs, from players to volunteers, to fans, and through them find out more about the sport, the club and its history. Each artist has worked using a number of disciplines including; photography, linocut, screen printing, photogravure and knitting to capture and portray original artwork as a legacy to the clubs involved. Lino-cut and screen print map of Beauly Shinty by Tom Smith. Artist Tom Smith from Lateral North has been working with Beauly shinty club to develop an interactive artwork to showcase three stories at a local, national and international level which highlights the significance of shinty within the community. Through the use of augmented reality they aim to bring these compelling stories to life. Perhaps the saddest story explores Beauly’s team during the First World War. 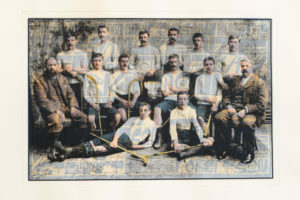 Regarded as perhaps the communities greatest ever team, Beauly shinty club won the Camanachd and Mactavish Cups in 1913, the first club to do that double. The team was captained by Alastair Paterson and his brother Donald played along side him. Shortly after that great victory both brothers would leave for war and never return. The community and club were devastated by the loss, with 13 men from the village’s Ferry Road alone never returning home. Donald, a great piper, was killed at the battle of Festubert where his blood- stained pipes and a pipe tune were recovered. This tune named, ‘Beauly shinty club’ was thought to reminisce the 1913 victory. A generation later the pipes how now been taken on by his nephew and renowned piper Duncan Macgillivary. These restored pipes have now been played around the world including Cocacabanna beach. Artist Roddy Buchanan was interested by the interaction of the players on the field and his work on Fort William Shinty Club captures the moments when player lock in battle. 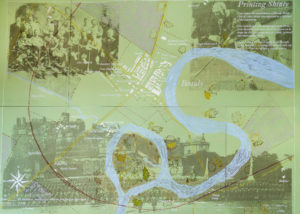 Screen print map of Newtonmore Camanachd by Deirdre Nelson showing the numbers involved in running the club. Deirdre Nelson, who looked at Newtonmore Camanachd, works with textiles, including projects based in Fair Isle and Shapinsay. Deirdre focused on the community and the numbers involved at maintaining the club, both on and off the field. 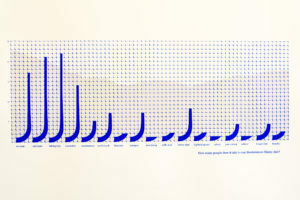 One of her findings was that there were more bakers than first team players, which she has documented in screen print. Skye Camanachd by John MacNaught. Screen print on photo gravure print. John McNaught grew up in Skye and is an artist working from Cromarty in the North of Scotland. 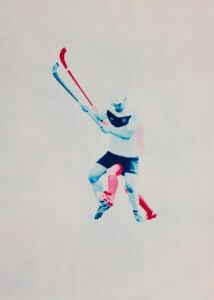 He used mixed media print making to mark Skye Camanachd celebrating 125 years. The project is organised by Highland Print Studio and funded by Highland Culture Strategic Board’s ‘Highland Culture: Take Pride, Take Part’ programme.